They say not to judge a book by its cover, but how can you resist with covers like these? Is she the spoiled heiress or a lady’s maid with a secret to keep? Russian princess or an opera singer past her prime? Mobster or mortician? It’s difficult to tell – unless you have a keen eye for detail. The Novel Collection is a study in contradictions. Dark wicker slats invite you in for a closer look like open window blinds. You know you shouldn’t, but…why not? 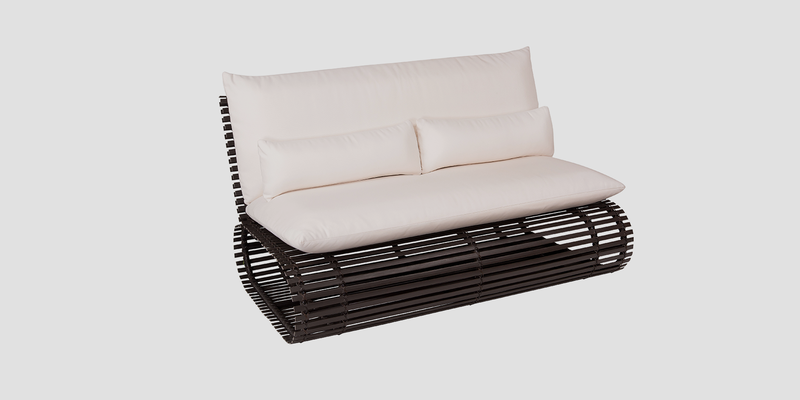 Closer inspection reveals that each piece has been meticulously woven to a tubular aluminum frame, which curves seductively beneath your legs as you sink deeper into the supple cushions. “Have these been here the whole time?”, you wonder. They look so new and yet…like they belong here. If only furniture could talk, you think as you kick your other shoe into the pool. The cast of characters is similar yet distinct – a strong family resemblance you might say. Was it the lounge chair or the love seat? The ottoman or the coffee table? As with any good novel, the secret can only be revealed once all have been gathered together (and after a lengthy monologue, of course). Who did it? We could tell you, but that would ruin the stori.